The utility company Linz AG relies on a BEUMER Group Pipe Conveyor to transport household and industrial waste as well as sewage sludge from the treatment plant to its power station. This conveyor is not only highly energy efficient, but due to its closed design, it is also possible to convey waste products through public spaces without affecting the environment. The result is: no material loss, no unpleasant smell, and most importantly no pollution to the environment. The Pipe Conveyor can also be optimally adapted to the routing due to its ability to navigate curves. Linz AG’s waste incineration power plant has been in operation since 2011. 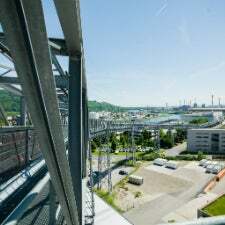 It is located in the industrial area of the port of Linz, next to the already existing biomass power plant and the district heating plant on the banks of the Danube. In this plant, the company generates district heat and electrical energy for its networks. The utility company manages the entire waste removal process, from collecting to eco-friendly recycling. "We can guarantee much higher supply security in our district heating network as well as adequate waste disposal", explains Erich Ehrentraut, engineer and head of waste management at Linz Service GmbH. Generating energy from waste and residual material incineration is particularly efficient. The produced heat can be used to generate energy or for steam turbine processes. Trucks, ships and trains transport about 150,000t of household, commercial and industrial waste to the residual material processing plant located on a neighbouring property of the Linz tanker port. Additionally, approximately 50,000t of dehydrated sewage sludge are processed in the wastewater treatment plant in the municipality of Asten located 13km away. The sludge as well as the screenings are transported directly from the Asten plant to the power plant. The highly efficient residual material processing plant sorts and shreds the waste, separating ferrous and non-ferrous metals and impurities. Finally, particles of 80mm are transported into the fuel bunker with a capacity of 3,000t. "The residual material processing plant and the heat and power plant are located several hundred metres away from each other", describes Erich Ehrentraut. To complicate matters further, a public street is crossing the route. "We had to guarantee absolutely safe material transport", he says. No waste, not even the smallest amount, can fall on the ground. Additionally, the odour of the waste could not be a nuisance to the people living in the area. The people in charge of the project at Linz AG evaluated several different solutions for the bulk material transport. They then opted for the BEUMER Group Pipe Conveyor. "The particularly efficient system convinced us", Erich Ehrentraut reports. BEUMER Group is a globally active system supplier for innovative intralogistic solutions. The group has bundled its comprehensive expertise spanning various industries and established different Centers of Competence in order to offer optimal global support of their single-source solutions. The ‘Pipe Conveyor’ segment is one such Center of Competence. These centers are in charge of worldwide project management and sales. They collect and process the expertise from the individual local group companies and pass it on to the global group experts in each respective field. "Together with the people in charge of the project, BEUMER developed an ideal solution tailored to the customer’s requirements", says Josef Staribacher, managing director at BEUMER Group Austria. Pipe Conveyors not only protect the environment from falling items during transport due to their closed design, they are also able to navigate long distances and tight curve radii. Due to this characteristic, considerably less transfer towers are required compared to other belt conveyors. This allows for substantial cost savings for the customer and BEUMER can easily customise the system to the individual routing. BEUMER supplied and installed a Pipe Conveyor with a centre distance of 475m. It conveys up to 40t of material per hour. The system is running around the clock, seven days a week. Due to the system design and the required system capacity, the Pipe Conveyor has been designed with a diameter of 300mm. The difference in height between the feeding and discharging point is 24m. The conveyor belts that we use are very durable and were specially manufactured for the Pipe Conveyor. Based on many years of experience, BEUMER has developed proprietary calculation programs that help to dimension all relevant parameters such as curve radii, conveying capacity and all other customer requirements. Another advantage of the BEUMER solution is the reduced noise emission that the system provides. This is achieved by using special idlers, low-noise bearings, and the correct conveying speed. "This improves the quality of our employees’ day-to-day work environment and ensures the people living near the conveyor line are not disturbed by the noise", says Erich Ehrentraut. High level of system availability guaranteed the system has been in operation for four years now and Linz AG is very satisfied with the results and benefits of the BEUMER solution. The utility company is also impressed by the high level of system availability, ensured by BEUMER customer support. "High-quality systems reduce machine malfunctions and breakdown and therefore minimise long downtimes", says Josef Staribacher. "This helps Linz AG to provide guaranteed energy supply, because it allows for continuous firing." But even high-quality systems require maintenance and service. If necessary, BEUMER service personnel come to Linz AG to check the system and perform the required adjustments.